With substantial donations from the Victoria Police Blue Ribbon Foundation the Ararat Hospital was able to purchase an image intensifier for its surgical department and new X-Ray equipment for the Medical Imaging Unit. This was a joint project between the Blue Ribbon Foundation and the local community through the Ararat Branch and was dedicated as a Police Memorial in memory of Sergeant John McNally who was murdered at the Mt Ararat Goldfields in 1856. Stage 2 of our commitment to the community of Ararat and their hospital was the construction of an emergency, helicopter landing pad that adjoins the already established John McNally Emergency Department. This project was undertaken in partnership with our Regional Branch in Ararat who then engaged their local community to not only assist with fundraising but to also provide materials and construction expertise for the helipad. This resulted in one of the most modern facilities of its kind in Australia and has been accepted as the standard for new structures. Automated transponders were installed along approach paths to activate landing lights and alert emeregncy department staff of an inbound flight. The helipad provides a first-response air-ambulance resource for the local community and surrounding district, 24 hours a day. 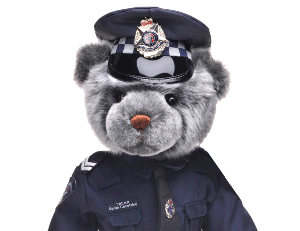 Cost of this project was $150,000 funded as a partnership between the Victoria Police Blue Ribbon Foundation, its Ararat Regional Branch and the Ararat Rural City. The Emergency Helipad was dedicated as a Police Memorial to Sergrant John McNally in October 2006 by Deputy Commissioner of Police, Kieran Walshe, APM. In 2003 works commenced on a complete redevelopment of the Ararat Hospital and the Victoria Police Blue Ribbon Foundation was able to contribute to the re-building of the emergency department. This was completed as a joint project in partnership with the local community through the Ararat Branch of the Blue Ribbon Foundation. Today the Ararat Hospital Emergency Department can provide state of the art emergency & trauma care to the people of Ararat and surrounding districts. This project, commissioned as a Police Memorial in May 2004, was the first stage in a continuing relationship with the community of Ararat and their public hospital. Sergeant John McNally became the first member of Victoria Police to be feloniously slain in the line of duty when he was murdered at the Mt Ararat goldfields on 16th October, 1856. Whilst trying to arrest a suspect over a string of armed robberies an associate of the suspect intervened and fired his shotgun, killing Sergeant McNally and seriously injuring his partner, Constable John Moore. Sergeant McNally’s sacrifice is acknowledged through this an other projects installed at the Ararat Hospital.